After the drinking, the food and the partying that comprised Christmas season (and let’s be honest, it creeps in earlier and earlier every year), as well as the sociable celebrations which so often accompany the start of the New Year, it can feel a bit – well, flat getting back into a regular routine again. Although this is perfectly normal, if you’ve been hit with a bad case of the January blues, there is a light – and it never goes out! It comes in the form of an SAD lamp, a now widely-accepted form of treatment. Now they don’t come cheap, but ever since these luminosities arrived on the scene, people have been raving about their positive effects. Also known as seasonal depression, seasonal affective disorder (SAD) makes otherwise mentally-healthy people suffer from a bad case of the blues in either winter or summer. The U.S. National Library of Medicine states that symptoms may include fatigue, difficulty sleeping or oversleeping, anxiousness, pessimism, decreased energy and difficulties concentrating. Sound familiar? While most of us won’t actually be diagnosed with SAD, we can all benefit from light treatment if we’re feeling low. There’s undoubtedly a change in the air as we move away from the cheeriness of Christmas, knowing that spring is at least three months away and it still feels like night-time at 4pm as January and February move by at a snail’s pace. So don’t suffer in the darkness – check out the brilliant products below and see if one might be able to help you. And if you’re looking for something decorative, don’t forget to look at our list of innovative and beautiful lighting. 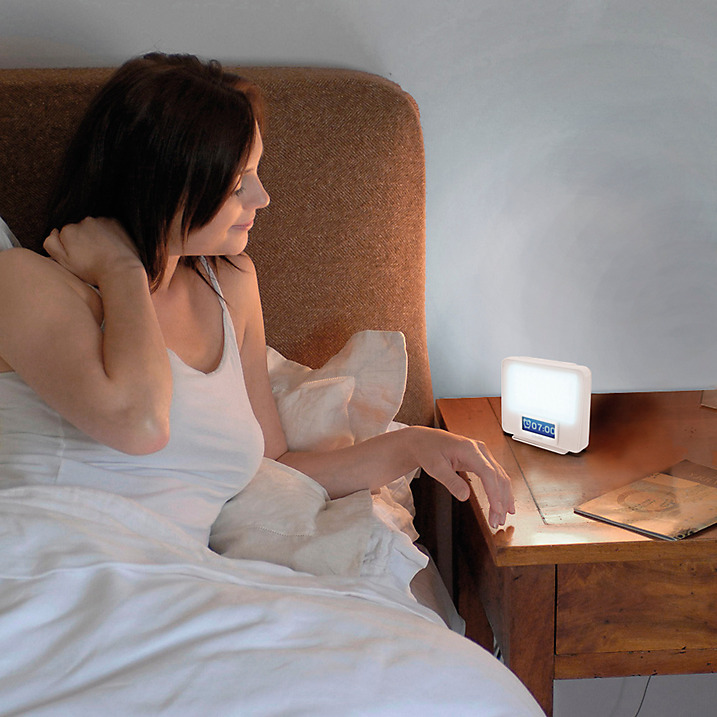 This combination light wants to make you feel good right from the moment when you first start to stir in the morning. Functioning as a wake-up lamp using a 15-30 minute ‘gradual sunrise’ setting, the Zest can then become a mood-boosting sunlight top-up on the dingiest of afternoons. It is slim and portable, making it ideal to take with you if you’re going on a trip somewhere. Available for £150 at John Lewis. 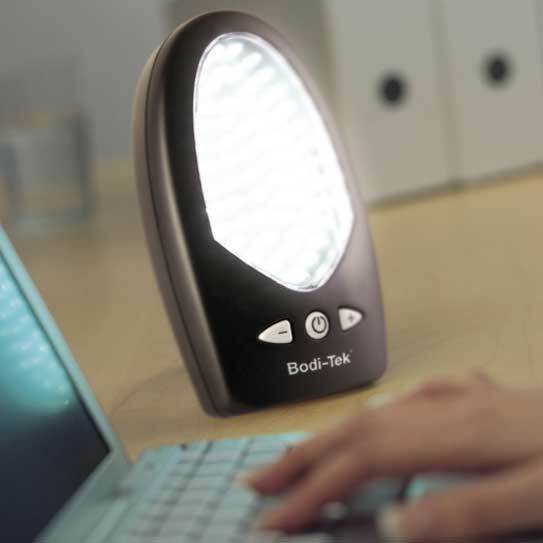 This budget SAD light is ultra-portable and aims to simulate natural daylight, acting as a non-intrusive room brightener so that your body and mind feel more awake. The light it gives off is non-glaring but bright enough to have noticeable effects; it will make those shorter winter days more bearable as you find yourself able to work through the difficult ‘dip’ some of us experience in the afternoons. Available for £44.99 at CareCo. 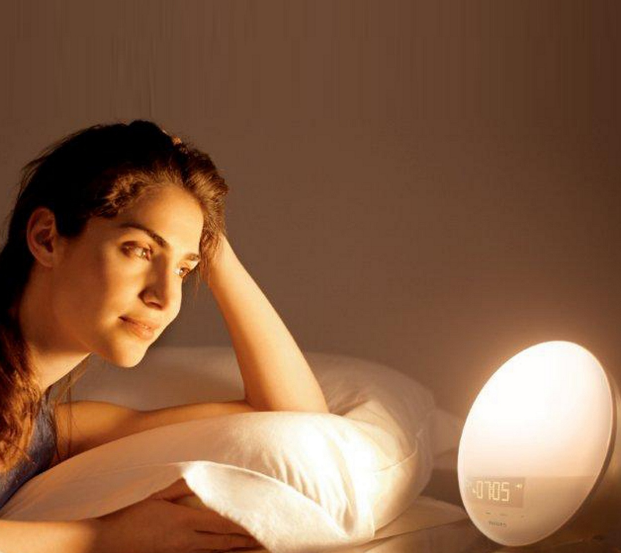 This alarm clock light takes inspiration from nature to simulate a more authentic sleeping and waking experience. The light can be set to dim slowly in the evenings, and gradually brighten in the mornings so that waking up won’t feel like the unpleasant shock we tend to experience in dark midwinter dawns. You can also set it to play ‘natural’ sounds, such as birdsong, or your favourite radio station (although it lacks the function of playing your own music). At £90, it’s pricey for an alarm clock, but the reviews speak for themselves: waking up is an altogether more peaceful experience with this product. Available for £90 at Debenhams. This light box is ideal for those who (like me) tend to feel their minds are clouding over a bit as the afternoon wears on. Instead of reaching for the coffee, it might be a better idea to invest in this – turning Brightspark on even just for half an hour will see your energy levels perk up. Available for £138 at John Lewis. 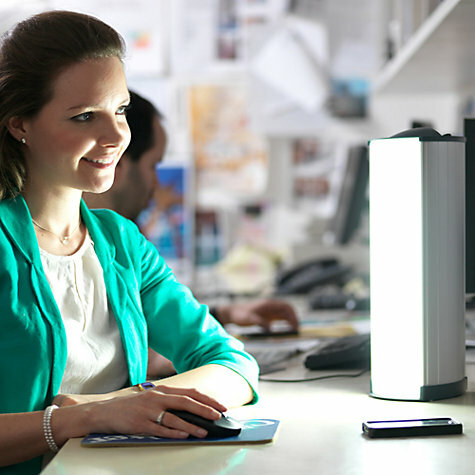 This SAD lamp is very good value – it uses 72 long-life, low-energy, high-intensity LEDs which can be dimmed or brightened to your personal taste to provide the perfect environment for working, reading, or just sitting. You can set it to fade on and off after a certain period of time, and at six inches high, it’s little enough to put on your desk or table. If you’re looking for a lower-cost SAD lamp to banish lethargy, this could be ideal. Available for £33.32 at Amazon. I recommend the Destroy Depression System for anyone suffering from depression. It is designed by a former depression sufferer and teaches 7 natural steps which help to eliminate depression from your life.